Most bike trainers fold up for easy storage. During the winter months it is difficult for most cyclists to continue training at the intensities and volumes they do during the warmer months simply because it is too cold to ride or road/trail conditions are too dangerous. For years cyclists were doomed to use either cross-training (running, snowshoeing or skiing) or stiff, unresponsive stationary bikes to stay in cycling shape. However, the advent of bike-specific trainers and rollers has provided a way to train in the winter on the bike you will race in the spring. 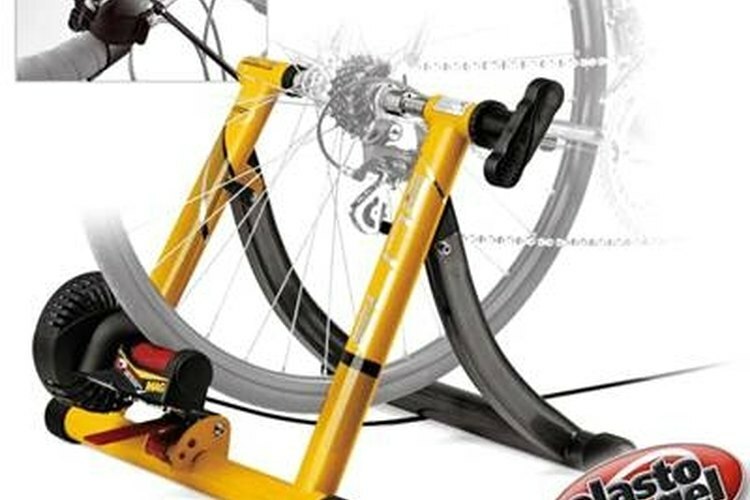 Trainers are devices that mount to the rear wheel of your bike and provide resistance while you ride the bike in place. Trainers allow you to put in the mileage and time required to perform well in the spring during the winter, and still stay warm. There are numerous trainers on the market, and picking one is not an easy task. Finding a trainer that will meet your needs and budget is important. Start by making a list of details about your riding style and training requirements. What type of riding do you do most often: trail, road or recreational? Do you race? Do you need a high-resistance trainer, or will training with low resistance suffice? Does your training demand adjustable resistance levels? Decide on a style of trainer. There are four types of trainers: fan, magnetic, fluid and electronic models. Fan models are cheap but loud. Magnetic models are quiet but offer limited resistance options. Fluid models are quiet and offer a variety of road-specific resistance options. Electronic models are quiet and extremely accurate, but expensive. Once you have decided on a trainer type, begin shopping around at your local bike shop, online at various outlet stores, and from mail-order catalogs such as Bike Nashbar and REI. When evaluating each trainer that fits your budget answer these questions: Does the trainer fold up? Does the trainer adjust to the appropriate wheel size for the bike I am going to use? What features are offered on the trainer (i.e., bells and whistles)? Narrow your selection down to three choices of similar quality, build, price, etc. Now it's time for aesthetics and general consumer opinion to come into play. Which trainer do you like the looks of more? Which trainer gets higher reviews from "Consumer Reports" or MTB Reviews? Which one will ship the fastest and has the lowest shipping cost? After you have answered these questions honestly and completely, there will be a clear winner. Purchase that trainer and get spinning! Ask the manufacturer of your trainer if there is a warranty or guarantee program that covers a certain amount of time from purchase. Enroll in this program just in case anything goes wrong with the trainer when you first get it. Do not get caught up in simply looking at price tags, as some very functional and solid trainers can be had for a steal.